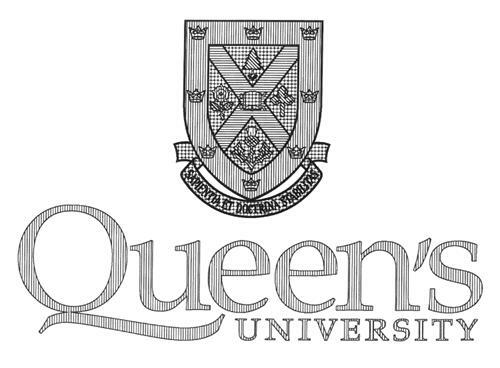 On Friday, December 5, 2008, a canadian trademark registration was filed for the above pictured logo by Queen's University at Kingston 300 Gordon Hall, 74 Union Street, Kingston, ONTARIO, CANADA K7L3N6. The Canadian IP office has given the trademark application number of 1420774. The current status of this trademark filing is Registration published. The correspondent listed for is GOWLING WLG (CANADA) LLP of SUITE 1600, 1 FIRST CANADIAN PLACE, 100 KING STREET WEST, ONTARIO, CANADA M5X1G5 The trademark is filed in the description of Clothing, namely shirts, t-shirts, tank tops, golf shirts, pants, briefs, rain suits, rain ponchos, sweatshirts, sweatpants, sweaters, vests, leotards, jackets, socks, underwear, hosiery, swimsuits, robes, shorts, hats, caps, visors, scarves, bandanas, toques, ties, gloves, wrist bands and headbands, belts; jewellery, namely rings, lapel pins, watches, broaches, tie clips, cuff links; affinity items, namely pens, pencils, pen sets, binders, card holders, picture frames, paper holders, golf balls, golf ball markers, golf tees, golf club head covers, umbrellas, clocks, calendars, calculators, lamps, plates, key chains, key fobs, towels, seat cushions, gym bags, duffle bags, luggage, sport bags, tote bags, backpacks, shoe bags, portfolios, brief cases, umbrellas, water bottles, magnets, wooden armchairs, wooden rocking chairs; glassware, namely beverage glass ware, coasters, vases, cups, glasses, wine glasses, tumblers, mugs; display materials, namely posters, pennants, wallhangings, decals, bumper stickers, badges, buttons , Arranging and conducting conferences, seminars, workshops and trade show exhibitions in the field of education; campus security services; career counselling services; chaplain services; charitable fundraising services; child care centres; child care services; conducting workshops and seminars in the field of career planning; educational services namely operation of a post-secondary educational institution; financial services namely the provision of student loans and payroll preparation services and debt collection services; operating conference, meeting, recreational and athletic facilities; encouraging intercollegiate athletic programs by organizing and conducting educational programs and activities for intercollegiate athletes and alumni; clinical research and technical consultation research services in the fields of knowledge, humanities, social sciences and physical, natural and applied sciences; retail sale services and online retail sale services featuring textbooks, general and reference books, periodicals, school supplies, art supplies, home and office supplies, writing instruments, stationary, wearing apparel, souvenirs, computers, computer accessories and peripherals, computer software, cameras and accessories, music and accessories and general merchandise; student counselling services; University services . (31) Trefoils -- Note: Including trefoils represented as symbols or appearing on playing cards. (34) Other flowers, blossoms -- Notes: (a) Including flowers or blossoms of trees (cherry trees, peach trees, apple trees) and of bushes. -- (b) Including flowers of protea and strelitzia. (36) Several flowers (except 5.5.7, 5.5.8, 5.5.18 and 5.5.23) -- Note: Not including surfaces or backgrounds covered with a repeated figurative element composed of flowers (25.7.25).